Sébastien and Lydia, a Canadian duo will captivate you with Sébastien’s Robichaud guitar and piano performances in combination with Lydia Ferland singing powers. Borderless beachfront BBQ dining and sunset cruises with cocktails and canapes. Themed degustation dinners including Spice Route, Thai Full Moon Dinner, Arabian Night, Pirates Treasure, Taste of Asia and International with BBQ Night. Interactive bubbly & nougat tasting sessions, cocktail making, festive afternoon tea and Thai cooking classes throughout the festive period. The festive dining supplement for Christmas Eve and New Year’s Eve is priced at USD 300 net and USD 450 net respectively on per person basis. It includes special dinner arrangements and entertainment. Experience palate-pleasing perfection at The Market where diners can kick start their day with an authentic feast the span across the globe. 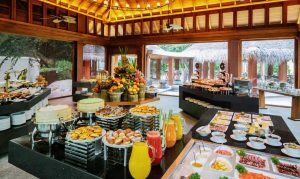 This self-serve full breakfast buffet includes everything from East to West, complimented with a variety of fresh seasonal fruits and a classic selection of pastries. 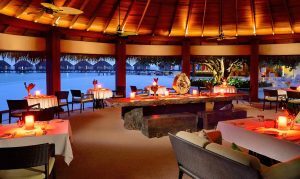 Return here for exciting themed buffet dinners in an unmatched Maldivian setting. Benjarong, our signature Thai restaurant serves authentic Royal Thai cuisine in a unique space that fuses contemporary style with traditional Thai designs. 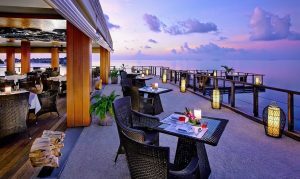 With recipes that have been passed down over generations, Benjarong brings the best flavours and tastes of Thailand to Maldives. Immerse yourself in the finest fusion of land and sea at Sea Grill! Feast on fresh seafood and steaks grilled to perfection, accompanied by side dishes from around the world, Relax by the poolside setting overlooking the breathtaking beauty of the ocean. A glass wine cellar offers the finest selection from vineyards around the globe. 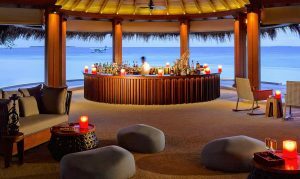 The Sand Bar is the perfect place to have a drink on a sun lounger or indulge in some tempting snacks while gazing out over the ocean. 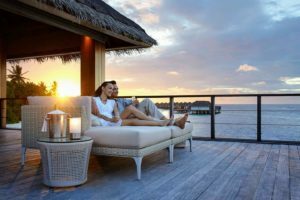 Situated alongside the infinity pool – one of the largest in the Maldives – treat yourself to a sunset aperitif before dinner or groove to the mesmerising musical tunes of the live band. At Sala Bar, romance comes alive! Watch the sunset whilst enjoying a selection of delicious canapés or stargaze over the sea whilst our mixologists makes you a sensational refreshment. Gather with friends or fellow guests to toast with a signature Thai cocktail, enjoying attentive service and panoramic views of the Indian Ocean. 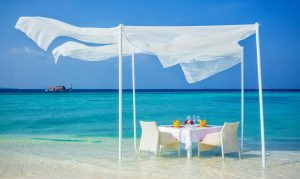 The Borderless Dining concept at Dusit Thani Maldives presents guests with dining options in unbelievable settings, featuring sumptuous menus designed to suit every occasion. Exquisite settings offer sweeping views of Indian Ocean, immersing guests in a truly multi-sensory dining experience. Carefully crafted dishes and innovative beverages complete the magical experience. Sebastien Robichaud and Lydia Ferland is a talented Canadia duo from Montreal. Composed of Lydia, leading in vocals and Sebastien guitarist, pianist and vocals. They offer a repertory of more than 300 songs in different languages and styles that varies from lounge, jazz, folk, rock and pop. The warm and enchanting voice of Lydia and the catchy melodies of Sebastien, charm guests throughout the world. The duo has also gained a solid reputation in various luxury establishments.